We need parents help to lead each meeting. Each family should take on a lead role at one meeting. This would be to provide the main activity of the meeting. The Den leader will set the stage for the meeting and lead the schedule. 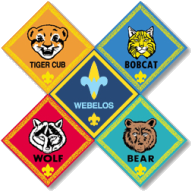 We follow our Wolf Handbook for meeting requirements and achievements. Please review and let us know if you can assist with a meeting.